Hi friends! I hope you all had a wonderful 4th of July! Ours was pretty good though I have to tell you, the kids much preferred the fireworks on TV than the ones going on in the street. Oh well. Maybe next year. Here's my card for today. The main image is from a page in a vintage book, isn't that little girl cute? The paper and die cuts are Cosmo Cricket's Material Girl. The stamp is Ippity, of course, from Just Wanted to Say. I stamped it on some Stampin Up paper that I die cut with Nesties Labels 8. She looks like a little girl guide/scout! love it! This is so cute. Love the image and color combo. This is adorable! 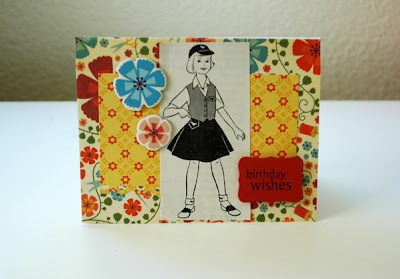 I love that you used that cute vintagey girl image! Love this girl :) Its awesome! This is soo adorable! Love that vintage image!